Considered decades ahead of her time by many of her contemporaries, Victorial Woodhull advocated the eight-hour day, a progressive income tax, profit sharing, and social welfare programs. In 1872, she ran for president of the United States; that audacious bid, coupled with her flamboyant personality, catapulted into celebrity and she became one of the most famous women in the country. 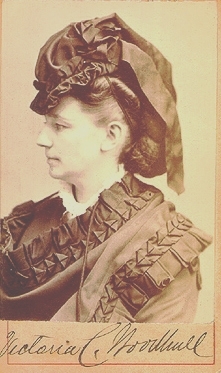 She was the leader of the International Workingman’s Association in New York; she owned a stock brokerage—Woodhull, Claflin and Company—making her the first female stockbroker on Wall Street; and she published a journal, Woodhull & Claflin’s Weekly, which was the first to print Marx and Engels’ Communist Manifesto in English, in 1872.